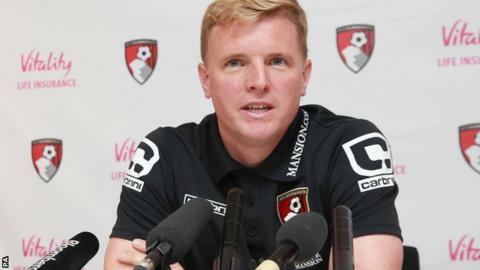 Bournemouth manager Eddie Howe feels his midfield needs more "beef" ahead of its first Premier League season. The Cherries manager says his summer spending is not finished despite already bringing in six new players. Howe also has concerns over an injury to midfielder Harry Arter, which could rule him out of their top-flight opener at home to Aston Villa on 8 August. "I'm aware we need to beef up in certain areas, but if not, I believe in the players we have already," he said. Arter, 25, has been absent from pre-season training since sustaining hip and groin injuries while playing for the Republic of Ireland against England in June. "Hopefully Harry will not be out for too long," Howe added. "We've had some positive news this week with his recovery. "If he was to be out long-term, we would be left with four recognised central-midfielders, which could leave us light in that area." Meanwhile, Bournemouth have agreed an undisclosed compensation figure with Blackburn Rovers for winger Joshua King. The 23-year-old signed a three-year deal with the Cherries in May after rejecting a contract offer at Ewood Park. Rovers were entitled to compensation for the Norway international under Fifa regulations as he is under the age of 24.